Online registration is scheduled to close August 18th at noon. Race-day registration for the Sprint Triathlon is available, however you will need to bring cash. Welcome to the 29th Annual West Point Sprint Triathlon! Come join us on the 19th of August and support our West Point Triathlon Team! The race will fill up quickly! 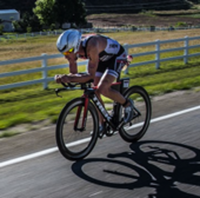 The race consists of a 750 meter Swim at scenic Lake Popolopen, a rolling 22km Bike along route 293, and challenging 5km Run through Camp Buckner and Camp Natural Bridge. Additionally, a just-for-fun youth triathlon will be held on the 18th of August for ages 4-14. Prices increase on 6 April and 6 August so register early! No refunds or exchanges. New this year we will have a Novice Wave! If you are new to triathlon or prefer to be in a less aggressive swim wave, register as Novice! The Novice wave will be the last wave and will start after all the other athletes have entered the water. This is a great way to race your first triathlon and become comfortable with an open water swim. For those athletes looking to gain points towards Age Group Nationals, our race is once again sanctioned by USA Triathlon. The youth triathlon will be Saturday, 18 August. Packet pick-up and transition will open at 0530 on Sunday, 19 August. The first wave will begin at 0830. Please see USA Triathlon Rules for the rules of this race. A 750m open water swim in the calm and beautiful Popolopen Lake. Swimmers will be waiting in the swim pens, 5 minutes before their Swim time start, to be counted and then corralled into the swim start area. The swim follows a counter clockwise direction, swimming around the peninsula and keeping yellow buoys to the left at all times. Canoeists will be in the water to ensure you stay on track and for safety purposes. You may use a kayak to stop and rest if you having difficulty, but forward motion by use of a kayak is forbidden unless for safety purposes. The ORIGIN Performance bike course is 22K in length and heads out of Camp Buckner via Patton Rd, then a right turn onto 293 before the bike turn around at the 5K point. Continue North east back towards Camp Buckner but continue past Camp Buckner until you reach the second turnaround point, just past the 15K point at the bottom of the long downhill section. Return back to the entrance of Camp Buckner and take a right turn and return to transition. The run course tracks a rolling course within the grounds of Camp Buckner. There are 2 main water/aid stations situated so they can be used on the way out, and then on the return from the turn- around where the aid station is located, for maximum hydration. The transition area is located in the large parking lot in Camp Buckner. The address for your GPS or Google maps is Camp Buckner, Patton Rd, West Point, NY 12518 This will bring you to the transition area, but be prepared to park in one of the nearby Lots instead. Finally, A sincere thanks to YOU! Your participation made this race possible. Your registration fee DIRECTLY supports the cadets on the West Point Triathlon Team. Without your support, the triathlon team leadership could not provide the training, equipment, or travel for our future Army leaders of character and enable them race all over the world and work toward being national champions.